The Mascarenes are composed of the islands of Réunion and Mauritius and Rodrigues. Together with Madagascar, Comoros and the Seychelles, it forms part of the Western Indian Ocean Islands Biodiversity Hotspot. The islands are volcanic in origin, formed between 3 (Réunion) and 8-10 million years ago (Mauritius and Rodrigues). Rodrigues, the smallest of the three islands, is only 109 km2 and is very much eroded with the highest peak reaching 398 m (Mt Limon). Mauritius, 1865 km2, has large plains surrounded by steep mountains, the remnants of an old caldera reaching no more than 828 m high. Réunion is the largest of the three islands (2512 km2), with a dramatic landscape (max. altitude of 3070 m) and an still with an active volcano (Piton de la Fournaise). The angiosperm flora of the region is generally well known. 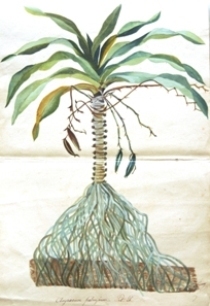 This is partly due to a long tradition of botanical studies particularly of the flora of Mauritius and Réunion which were systematically surveyed in the late 18th century by P. Commerson (1768-1773). However, Rodrigues was first botanised only in 1874, when unfortunately much of the native vegetation had already been destroyed. The flora of the Mascarenes is being thoroughly updated through the "Flore des Mascareignes" project (collaboration between the MSIRI, the IRD-Muséum national d'Histoire naturelle, Paris and the Royal Botanic Gardens, Kew). The project was initiated in the early 1970?s and is about to be completed with only three families (Cyperaceae, Poaceae and Orchidaceae) remaining to be published. 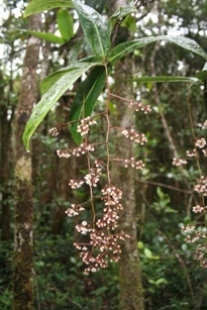 Rodrigues has the smallest native angiosperm flora of the Mascarenes with 150 species. Réunion has about 550 species and Mauritius 691 species. Single island endemism is high, ranging between 30% (Réunion) to 39.5% (Mauritius). Each island harbours an important part of the Mascarenes endemic plants: 47 species exist only in Rodrigues; 165 species in Réunion and 273 species are unique to Mauritius. Some other species are shared by two or all three islands of the archipelago. Endemism at the level of the Mascarenes is thus about 65%. However, some of the unique species are already extinct and most are threatened with extinction. Considering only single island endemics, Rodrigues has the highest rate of extinction (10 species or 21%), followed by Mauritius (30 species, 11%) and Réunion (2 species, 1.2%). The percentage of single island threatened endemic is estimated to be very high on all three islands, reaching 82% for Mauritius; 77.8% for Rodrigues, and 51% for Réunion. The high proportions of threatened species are largely the consequence of extensive past habitat destruction for agriculture and for other land uses. Almost none of the original native cover remains in Rodrigues, whereas Mauritius is left with less than 5%; while Réunion retains about 30% of its native cover. This massive habitat destruction has spawned threats like small population sizes and habitat fragmentation. For example, Mauritius has at least two species with only one known individual in the wild. However, the most important threat on all three islands is posed by the variety of interactions with invasive alien species, both animals (rats, monkeys, etc) and plants (the Strawberry guava - Psidium cattleianum - and many others). To avoid further species extinction and in order to preserve the plant communities of the Mascarenes, conservation management is vital. 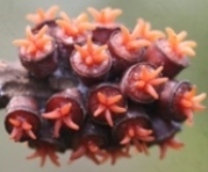 Ex situ conservation is undertaken on all the three islands as well as in some institutions in Europe, with many of the species on the brink of extinction being propagated and conserved in arboreta and botanical gardens in the Mascarenes and abroad. Major success stories include the rescue of Ruizia cordata (a Malvaceae which belongs to a monospecific endemic genus of Réunion), Dombeya mauritiana (another Malvaceae, endemic to Mauritius) and the café marron (Ramosmania heterophylla - Rubiaceae, belonging to an endemic genus of Rodrigues). The extent of the area protected for biodiversity conservation remains small in Mauritius and Rodrigues. It covers almost all the remaining native vegetation of Réunion within the island?s newly created National Park. Active ecological restoration, where invasive species are being controlled is spearheaded in the region by Mauritius through the Conservation Management Areas or CMAs, which comprise of samples of different native vegetation types weeded of alien plants and fenced against large alien mammals such as Rusa deer and pigs. These CMAs, while being a stop gap against continuing biodiversity loss, are currently too small for the long term survival of many plant species. The Mauritius Herbarium focuses on the plants of the Mascarene Islands (Mauritius, Réunion and Rodrigues) and other territories belonging to Mauritius (Agalega, St Brandon and Chagos). The Mauritius Herbarium was created in 1960 but its origin dates back to the 1830. This database is being developed using BRAHMS and it is made available for scientific purposes solely. It may not be sold or used for commercial purposes.